You can find me at either of our tattoo studios: every other week at Tattoo by Design in Eugene, Oregon, and at Turtle Island Tattoo, in Yachats, Oregon, where I tattoo by appointment. Trying to track me down? Always try calling, but the best way is through email – diane.tattoo@gmail.com – because I can get to it from either shop. If you’re not an email person, try texting to my email, and when I reply, it will come back to your phone. You might say I got into tattooing sideways. I started at Tattoo by in late 1993, when I started in the office and at the counter. Over the years, Bonnie Jean made use of my skills in graphic arts and typesetting, teaching me how to create tattoo designs for our customers. She must have asked me a hundred times, didn’t I want to be a tattoo artist? I’d say, “There’s no backspace key!” or “I can’t use white out!” But I did love the business, and finally, after six years in the shop, asked her to take me on as an apprentice. I’d already learned almost everything else; I just needed to learn how to tattoo and make tattoo needles. I did my first tattoo on October 1st of 2001, and am very glad I braved it. Like a lot of tattoo artists, I never really saw myself in this line of work till I got here. I originally moved to Eugene to pursue architecture, after getting my B.A. from the Evergreen State College in Olympia, where I grew up. My plan to study architecture never really came together (bills, parenting, life…), and in the meantime I found myself in the tattoo world, doing the office work I’d supported myself on for many years. What I thought was going to be a short-term job in the shop has turned into a career I love. I take this profession seriously, and learn more and more every year about this wonderful art form. I’m proud to work in Eugene’s oldest, and one of Oregon’s oldest tattoo shops, and to come from a long line of professionals who made tattooing what it is today. There are many things I like about being a tattoo artist, but a couple of things really stand out. As an artist, I love to play with color, shading, and shape – all critical to tattoo designs, including black and grey pieces. And even more than that, I love helping people document what’s important to them through the symbolism of their tattoos. You meet so many different types of people in the tattoo world, because every kind of person, from every walk of life, gets tattooed. Different personalities, so many life stories, incredible variety of artwork, and lots of reasons for getting tattooed – it keeps my job quite interesting! Outside work I live a quiet life. I live in my head, as they say, learning from everything, whether in book, tv show, or movie form, I enjoy sci-fi, fantasy and mysteries, and for my version of reality shows, throw in a little nature and science programming. It seems like the natural world creates art for us every day, and at my home on the Oregon coast, I’m never far from the ocean, a source of endless fascination. Tattooing has become more than just a job for me, something which becomes very apparent every time I see something in the world around me – a bird in flight, the way a flame curls in the night air, the shadow on a cheek, the soft color of a flower just opening – and think about how those images can be translated into a tattoo. I live a blessed life! 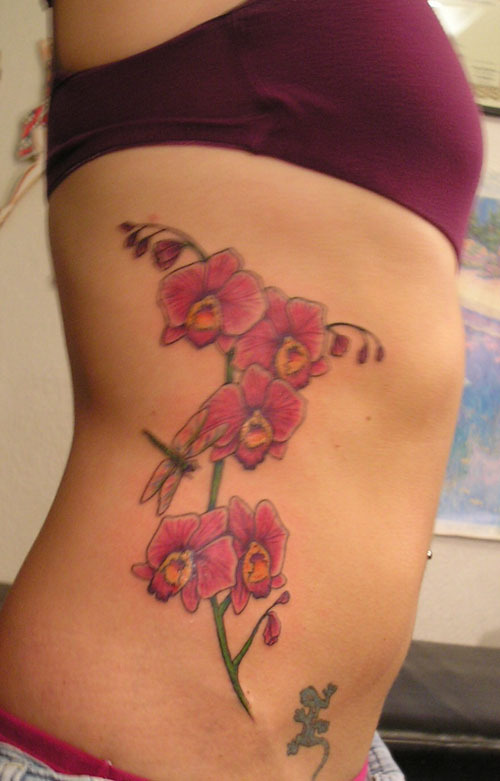 A few tattoos are pictured below – click any one of them to start a slideshow you can click through. You can also view my portfolio on the Tattoo by Design facebook page, or connect with my own facebook profile to see what I’ve posted lately, and who’s tagged me in their photos. I’m a recent convert to Instagram, where you can find me under dianegruver.tattoo.